Innerside Jokes - The Inner Tube! 20 Innerside Jokes as compiled by Trube Fan Jeff Ross. Inside jokes (or references) unique to the Inner Tube. Used whenever the number sixteen is mentioned, or whenever a number has to be given to show increase or progress. Used to indicate the likelihood that a certain decision would have been made by Kevin if he were in that circumstance. Used when sarcastically acting offended OR to express playful displeasure with an expressed opinion, often while the opinion is still being expressed. ​Refers to the original vision of the show (answering listener questions to assist and encourage aspiring content creators) and returning to it after some time on the show doing other things. Said to affirm an assertion/assessment from the sentence prior in the conversation. Used whenever a money-making idea is suggested. A reference to a former family member of Kevin's. Used to help relate a concept directly to the Inner Tube audience (“Innertube-ify it”, if you will); the most common example is saying “Trube” instead of “True”. A phrase used to imitate outrage, usually used when jesting about people (all people, not just conservatives) who do not understand what “censoring” actually means. 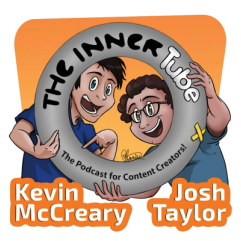 Refers to the political podcast that Josh and Kevin started to help keep politics and controversial opinions off of the Inner Tube. Kevin’s farewell that exists at the end of almost every Inner Tube podcast recording session, whether he edits it out or not. Phrase that “people on the street” come up to Kevin and ask right before he explains how he has become successful in certain aspects of life. Phrase developed at a time when the Inner Tube wasn’t actually edgy, ideally used in a joking manner to describe mildly controversial Inner Tube content. Said to signify the end of a series or list so the audience isn’t left wondering whether there was more to it or not. Phrase developed back when Kevin would edit the show, now a joke that acknowledges the unedited nature of the majority of the Inner Tube. A playful euphemism for "jerk". A reference from a video from the Blimey Cow YouTube channel, in which a character reacted by shouting this phrase after finding out something was labeled as “Christian”, regardless of whether that thing was actually Christian or not. Literally “facebook.com/joshtaylor”; the joke is that the page doesn’t actually have much influence yet promotes successful projects, so the success is attributed to the promotion on Josh’s Facebook page. Thanks to Trube Fan Jeff Ross for compiling these references.